I just got this in from a customer... how PRECIOUS! Lydia, who is not yet five years old, has just started the subtraction section of Math Mammoth 1A. She made an amazing discovery and wanted to tell you about it. A photo of her letter is attached, which a translation here. Lydia's mom also said that she feels Lydia is going to be so amazed when the workbook points this out a few pages from now! This is a GOOD comparison between the standard multiplication algorithm and lattice multiplication! The author even brings in the area model for multiplying multi-digit numbers (which I also show in Math Mammoth). The area model is of course only used to show students what is going on, based on place value -- not to replace any algorithm. Math Mammoth printed books at now at 20% off at Rainbow Resource Center! BOTH have full-color covers so you cannot go by that. The full color books cost slightly more. You can mix and match if you'd like, such as by purchasing the student books in full color and the answer key and test books with black-and-white inside pages. This promotion runs till June 2, 2017. Now there's a place where you -- or your child -- can practice math facts with your VOICE! Just say the answers out loud to the computer! You do need to use Google Chrome for it to work with voice... otherwise, it does also have buttons you can push to give your answers. Youngsters might find this intriguing to try out! Here's a video -- A Mathematical Fable -- that I showed to my girls recently. It ties in with the Pythagorean Theorem and is kind of interesting and funny at the same time! Enjoy! 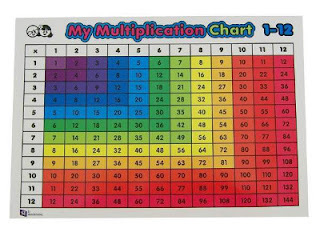 Here's a different way to look at the multiplication tables chart: COLOR IT!